Well, life certainly got busy for me in a hurry, so this has been a while in coming. I apologize for the delay. In recompense, please accept one (1) small bonus video, one (1) episode, and one (1) big Bible Study Time. Please view the videos in the order I just listed and also watch the bonus video before reading Bible Study Time in order to maximize entertainment and understanding. So between the two videos we heard about a flood twice. Can we get some more info about that? So, first off, let me say that the idle video saying "second great flood" is pretty confusing. Not only does it directly contradict the story of Noah's Arc in Genesis (in which God promises there will never be a repeat performance), it also places El Shaddai after Noah's flood, which would have taken place after the Grigori and Nephilim were dealt with. So let's just ignore the word "second" and proceed as though the flood that gets mentioned is the first and only. As time passed, humanity collectively became a bunch of shitheads. Evil and wickedness filled their every thought and action. It got to the point where God regretted creating them in the first place. He felt that a reset button was needed. To that end, He decided to cause a great flood that would kill all the humans. But there was one human in particular who wasn't on God's shitlist: Noah. 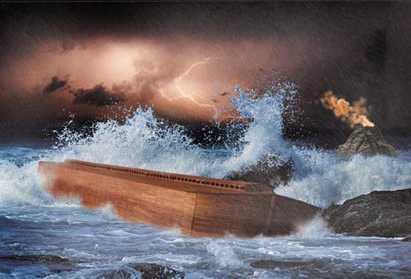 God decided that Noah was righteous enough to be spared, so He sent him a set of instructions: construct an enormous boat that would house you and your family, plus a male and female of every animal. Among other things, the boat was to be 450x75x45 and have 3 decks. After this was completed, God made it rain for 40 days and 40 nights, causing a flood great enough to kill all the humans. 150 days later the water was allowed to dry up. God then caused a rainbow to appear as a covenant with Noah, signifying that He would never again use a flood to kill all living things. Now, everyone who has heard this story has probably heard it told that God flooded the entire planet. Interestingly enough, the Bible itself does not support this. To explain why, we need to look at the original Hebrew text. Yes, I'm going to be that guy right now. You need to read it in the original language to understand it properly. To put a slightly finer point on this, the flood narrative uses the same language (not "kol erets" in this case) to say "the face of the earth" as when God banishes Cain. Unless we're to believe that Cain was shot into space, we have to look into a more local interpretation of the words. Interestingly, the Old Testament does have one particular word in it that always refers to the entire planet. The word is tebel (Strong's H8398), which is found 37 times in the Old Testament. The word is never used to describe the flood, but it is used extensively to describe the creation of the earth and the judgment of the peoples of the earth. There are other indications in the language that the flood was more localized than modern English translations imply. In Genesis 7:20 ("The water prevailed fifteen cubits higher, and the mountains were covered"), the Hebrew word ma'al that gets translated as "higher" actually means "upward", meaning the water was 15 cubits, or 20 feet, deep. Plus, the word har is more often used to refer to hills than mountains. Genesis 8:14 reads as saying "By the 27th day of the 2nd month, the earth was completely dry". It'd be a bit much to assume that all the oceans and lakes were dried up and the entire planet was made a desert, so "the earth" must mean something more local. There's even a bit in the New Testament about it. In 2 Peter 3:5-6, Peter says that "the world at the time was destroyed, being flooded with water". The qualifier "at the time" means he is referring to where humanity was at the time. Since humanity didn't scatter until Genesis 11, it's safe to assume that they were still pretty centralized in Genesis 7-9. The qualifier would be completely unnecessary if the flood was global. Ultimately, it makes far more sense, both from a logical and language-based perspective, to read the story as having the flood confined to the Mesopotamian flood plains than spreading over the entire planet.